Travelling round the schools, I encounter a very varied selection of music trolleys, music cupboards and their contents. This is why, in the boot of my car, along with a trumpet, a Lyons C clarinet, a B flat clarinet, a ukulele and a djembe, I also have a bag with two sets of boomwhackers, a bag of 30 little fruit shot drink containers with the fruit juice replaced by varying quantities of rice, and a box with a 14 pairs set of home-made claves (short lengths of doweling with the ends rounded off). This collection has cost me very little; if you shop around, you could get the the boomwhackers for around £16 for an octave set, and the claves were very nearly free. I have, in exasperation, splashed out on some more kit. Firstly, I have ordered a box of budget beaters. This is because many schools have such a horrible assortment of mismatched, broken, bent and useless implements, that it is going to be easier to take my own. It will also solve the problem of a school having an extensive set of chime bars, but totally misplacing all their beaters. 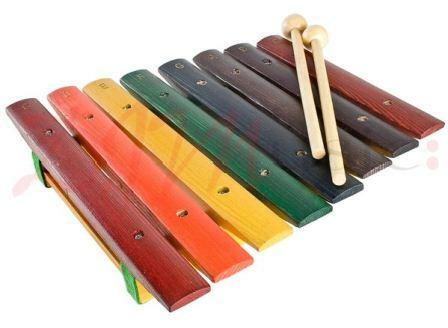 In a moment of weakness, I have also bought five sweet little wooden Tiger xylophones to add to the stuff in my car. They cost around £6 each, have colour-coded bars and two wooden beaters, and are reasonably well tuned to play a scale of C. Now, at last, I will be sure of having some decent, attractive, functional, melodic instruments to use in music lessons whenever I want, wherever I am. I will make a point of impressing upon the children that these are MY OWN INSTRUMENTS, bought with MY OWN MONEY. Sadly, many children need to be educated out of the mindset that musical instruments are to be played as loudly, violently and extravagantly as possible. Let’s just see how long they last. I am referring to the xylophones, of course. PS I have not been asked, or paid, to review this, or any item, ever! This entry was posted in The Jungle, The organised teacher and tagged beaters, boomwhackers, claves, instruments, xylophones. Bookmark the permalink.